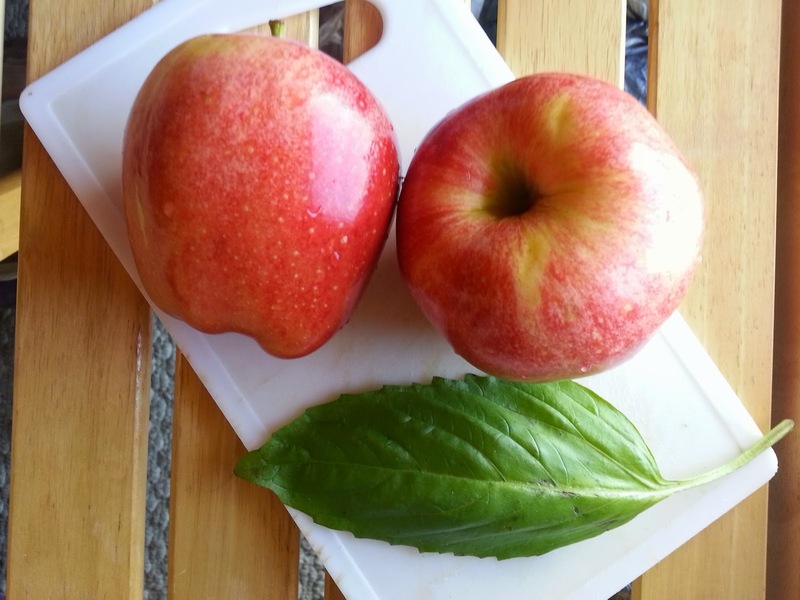 This month for Crazy Ingredient Challenge we are cooking with apple and basil. I had a few ideas in mind. 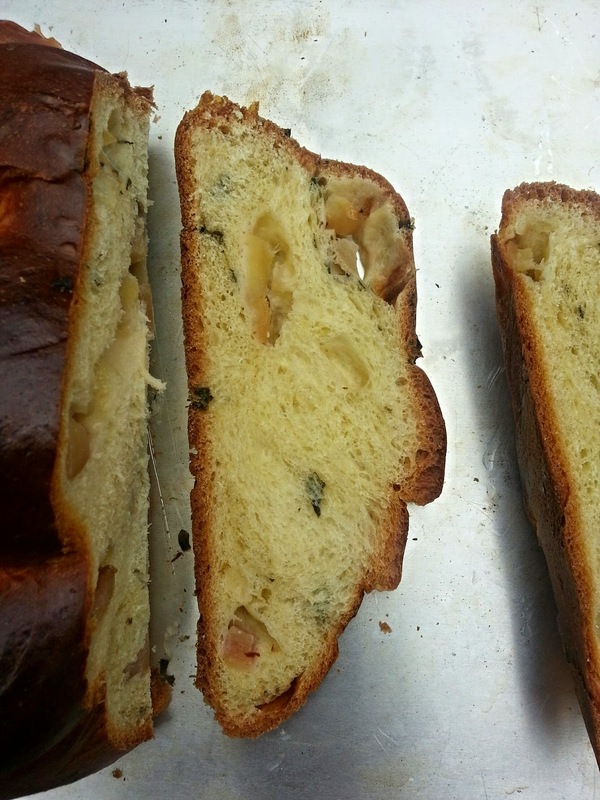 I thought a pork dish would be perfect but ultimately settled on an apple basil challah. 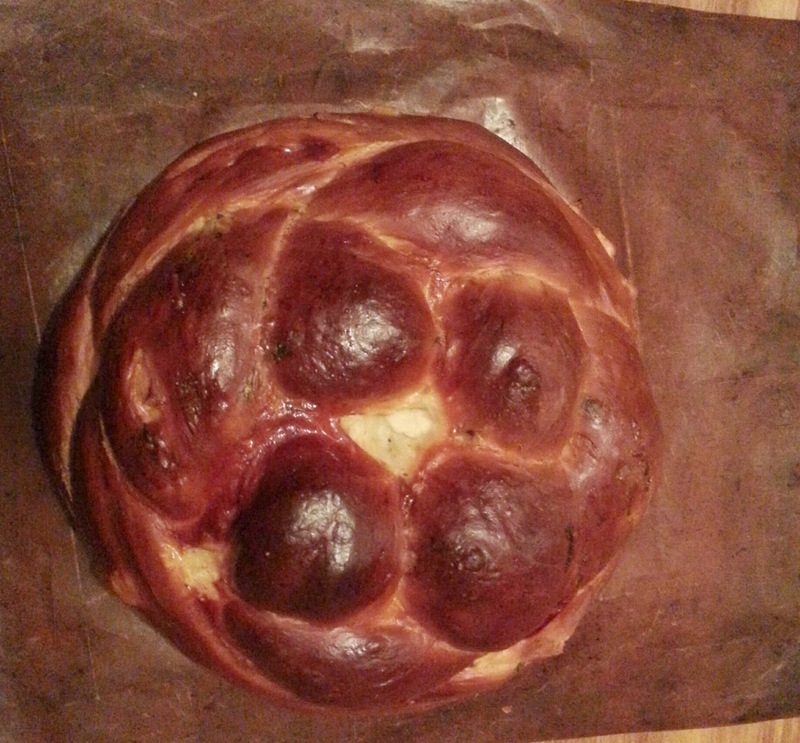 I had wanted to bake a challah since I made the beet bread pudding last month. The loaf that I made for that was a water challah (no eggs) so it was time to add the eggs. Plus, I love braiding loaves and I look for any excuse to practise. This bread is not sweet. If you want a sweet challah, increase the sugar. You could even sprinkle sugar over the crust or even add sugar to the apples. I did not want a dessert challah so I didn't do that. Later, I will make French toast and can add all the sugar that my little heart desires. This is HUGE loaf - 1.08 kg. I have to get creative before it's too stale to eat as is. Right now, it's soft and fluffy and I can't stop eating it. The basil gives just the perfect background note. I probably could have used more basil and if I ever make a basil bread again, I will. Combine all the ingredients except salt, apple, basil and egg white and knead until just combined - about 1 minutes. Let rest for 10 minutes then add salt and basil. Knead dough for 6-8 minutes (in a stand mixer) until it forms a smooth tacky (but not sticky) dough. 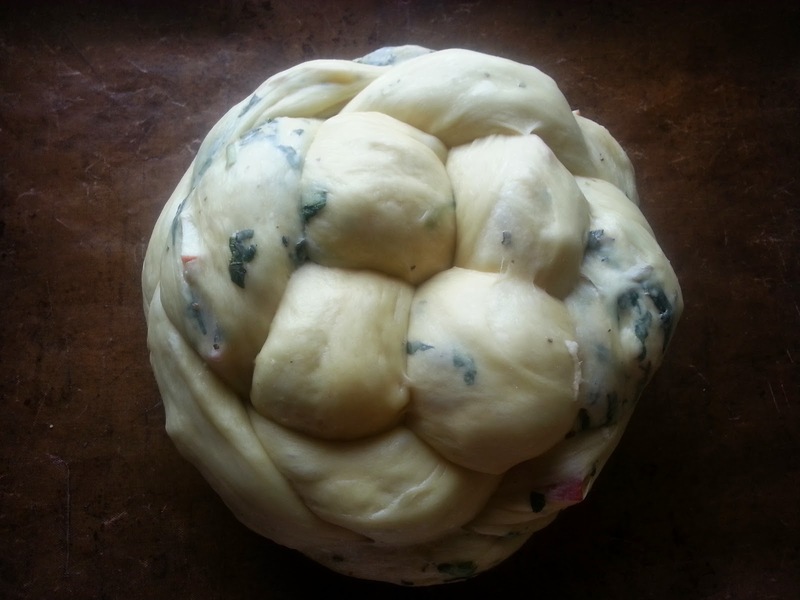 Form the dough into a bowl and place in an oiled bowl. Cover with plastic and let rest until doubled. This could take up to two hours but depends on the temperature of your room. When the dough has doubled, divide it into 4 equal pieces. Flatten each piece into a roughly 9"x 2" rectangle and fill with apples. I used approximately 1/2 cup of apples per rectangle. Roll the rectangle into a tube, sealing the apples in. Keep rolling the tube until it's about 12 inches long. Braid dough.See instructions for the 4 strand weave/round challah here. Whisk the egg white with 1 tablespoon of water and brush over braided loaf. Allow loaf to double once more. This could take 30 minutes to 1 hour. When loaf has risen, brush dough with remaining egg wash. Bake loaf for 40-45 minutes or until loaf reaches 195 F.
Let's start this with a confession. When Tux of Brooklyn Homemaker chose "Autumn Harvest" (focusing on autumn produce) for this month's Bundt Bakers, I was a bit thrown. You see, nothing really stands out to me when I think "autumn harvest". Of course I know all the produce associated with fall. But I was trying to think of what was quintessentially fall for me. I grew up in Jamaica. We ate pumpkin at least once per week all year round. Same with sweet potatoes. It doesn't help that I am now in South Florida and there are no apple orchards nearby to think about going to for apple picking. Do they have pumpkin patches here? I should look that up. 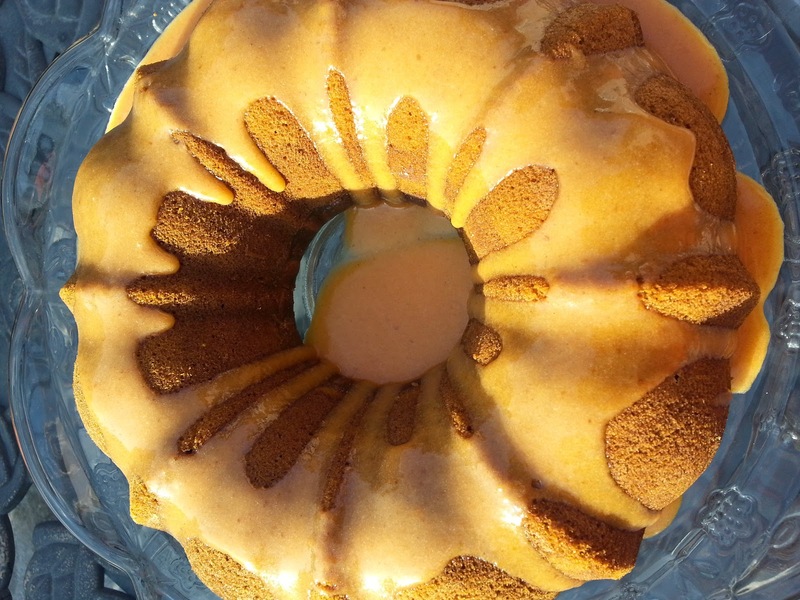 However, within a few moments, I knew that I would make a pumpkin cake. I had always wanted to make (and taste) one so this was finally the time. I added espresso to half of the batch because I wanted to try the zebra/stripe effect - not just marbling. I also happen to love coffee flavoured desserts so I thought I'd see how the two worked together. .As much as I love coffee flavoured desserts, you won't find me drinking the stuff. There just does not seem to be enough sugar and flavoured creamer in the world to get it tasting like something that I would like. Basically, I try to make a cup of coffee taste like ice cream. Oh....we are here to talk about cake. Sorry about the ice cream tangent. Right, so I wanted stripes. The stripes worked out well but it was just a little tedious! For the larger pan, I poured a quarter cup of batter at a time into the pan. With the smaller pans, I poured by the tablespoon. Even though it took a little longer than normal, I think I will definitely try this again. I didn't go full on pumpkin spice here and I only slightly regret it - just cinnamon and a pinch of nutmeg. I really could have used more cinnamon. 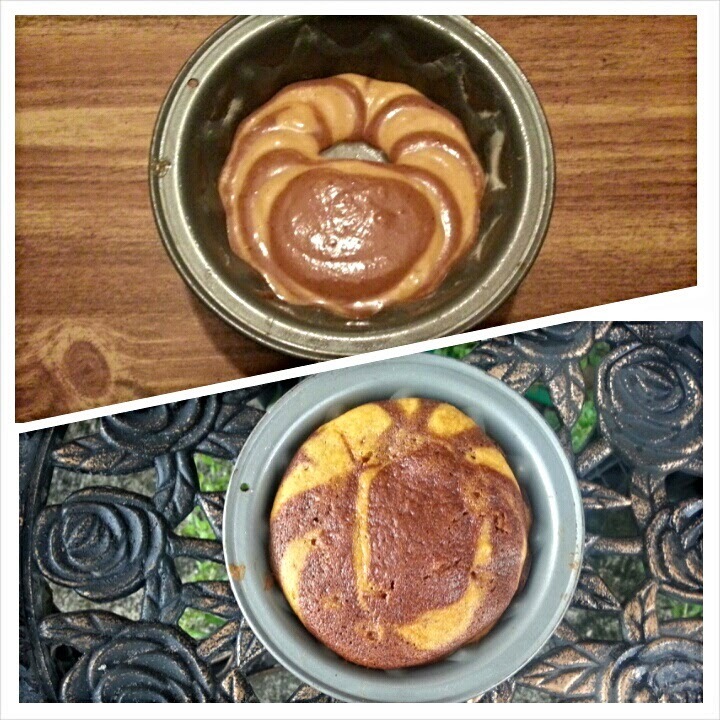 Thanks, Tux for making me finally taste a pumpkin cake. 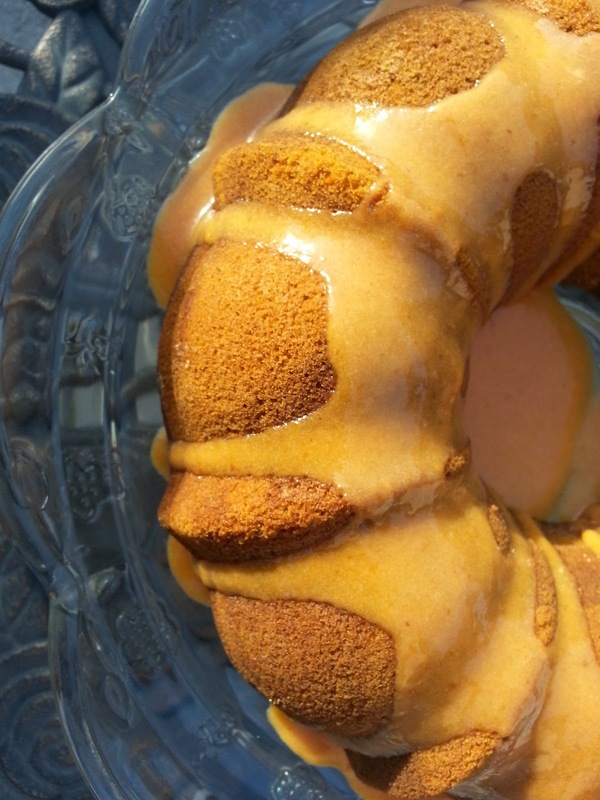 Scroll down to see what other cakes the Bundt Bakers made this month. 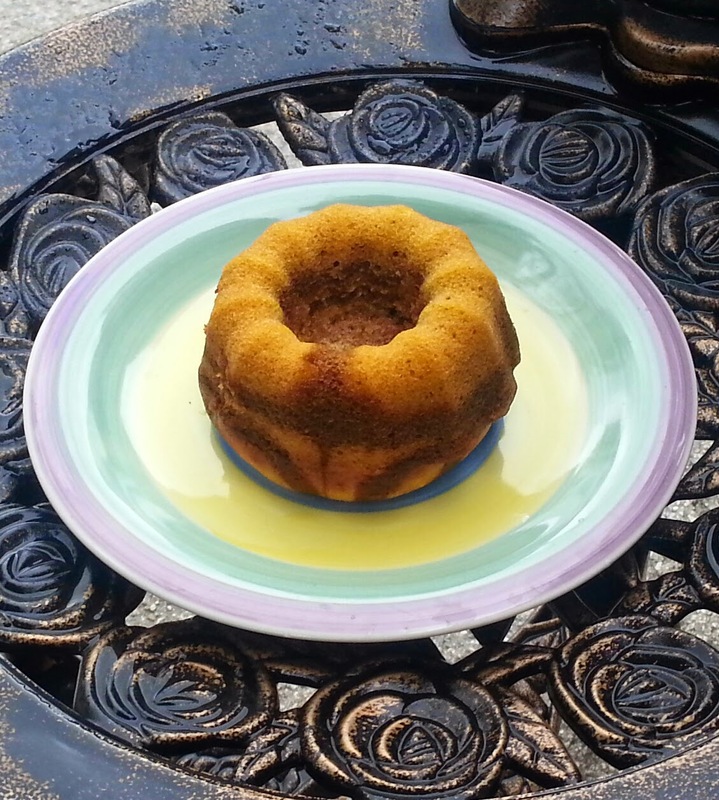 Preheat oven to 350 F. Thoroughly grease a standard sized bundt pan. Dissolve the espresso powder in a tablespoon of water and set aside. Whisk together flour, baking soda and salt. Cream butter, sugar, cinnamon and nutmeg until light and fluffy. Add the eggs one at a time until fully combined. Stir in vanilla, pumpkin and oil until thoroughly combined. Starting and ending with flour, alternate adding flour and milk to the mixture. Stir until just combined with flour streaks remaining after each addition. At the end, stir until no streaks remain. Divide the batter into two. Stir the espresso into one half. 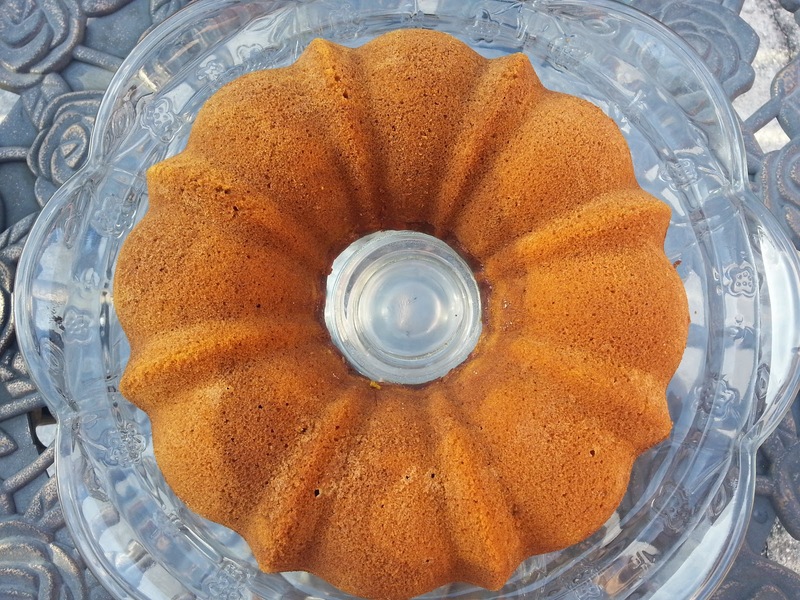 Pour a quarter cup of the plain batter into the bundt. Then pour a quarter cup of the espresso batter in the center of the plain batter. Both batters will spread on their own. However, if the batter is a bit thick, you can rap the pan lightly on the counter to help the movement. Keep pouring alternate batters into the center of the previous batter. When cake is cool, whisk together powdered sugar and milk until smooth. Add the remaining ingredients. When the glaze is homogenous, pour over cake. The last ten days in the kitchen have been a struggle for me. (Were I being more honest, I would say that it has been the last month but the last ten days sucked the most.) My friend's birthday was last Monday and every year I make her a cake. I just could not decide on a cake this year. For several weeks, I dismissed ideas. Finally, time was running out and I whipped up a coconut chocolate cake hoping to top it with a fluffy coconut frosting. Chocolate cake. I have made several. I have made that particular recipe once before but without the coconut. I expected no trouble. Ha! The cake did not rise. I was shocked. I had already told my friend's husband to pick up the cake in a few hours. I cleaned up the kitchen, cancelled the pickup and sulked. Day 2. New plan. Red velvet cake. Same coconut frosting. I can do this. Baked perfectly. Yes! Back in business. I just need to let it cool. Oh, let me rest it ....suddenly the cake flew out of my hand, slid across the table and landed upside down on the floor. Clean up red cake. No pickup to cancel this time. I knew better. But there was sulking. Day 3. New plan. Marble cake (red and white). Bake cake. Check after timer goes off. Needs a few more minutes. Reset timer.Leave kitchen. You know what I forgot to do? I forgot to put the cake back into the oven. There were other mini mishaps-like an egg fiasco. But I don't want to think about it. Let's talk about waffles instead. 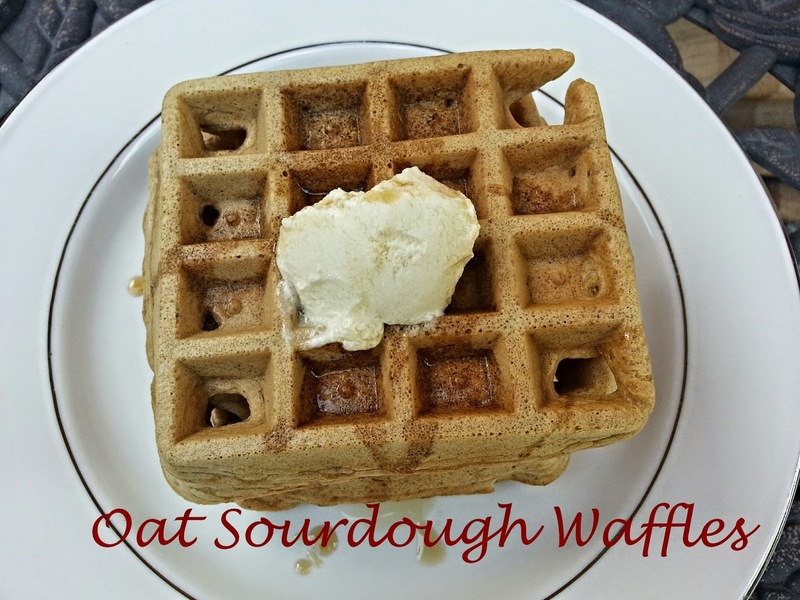 Specifically, these Oat Sourdough waffles. They have that lovely sourdough tang, some oats to make them a little more hearty plus some spices. I am not big on pouring syrup on waffles but I did try to add just a little to these. I have no problems eating cake for breakfast (what do you think happened to the cake that didn't rise?) but I just can't seem to pour syrup on my waffles. Typically, I use waffles to make sandwiches. I did that with these after the first lightly syrup-ed one. Lots of great waffles below so scroll past the recipe to see them! Combine milk, starter, flour, oats and sugar. Combine and let rest overnight at room temperature. Beat eggs, oil, cinnamon, nutmeg and salt and add to overnight sponge. Stir until just combined and let rest for 5 minutes. Cook according to waffle iron manufacturer's instructions. Welcome to the Foodie Extravaganza! We are a group of bloggers who love to blog about food! And each month we all incorporate one main ingredient into a recipe. This month the ingredient is waffles. We hope you all enjoy the delicious ways we made our waffles and be sure to come to see what next month’s new ingredient is. If you would like to join our group and blog along with us, come join our Facebook page Foodie Extravaganza. We would love to have you! Make sure to check out these great recipes from our group!